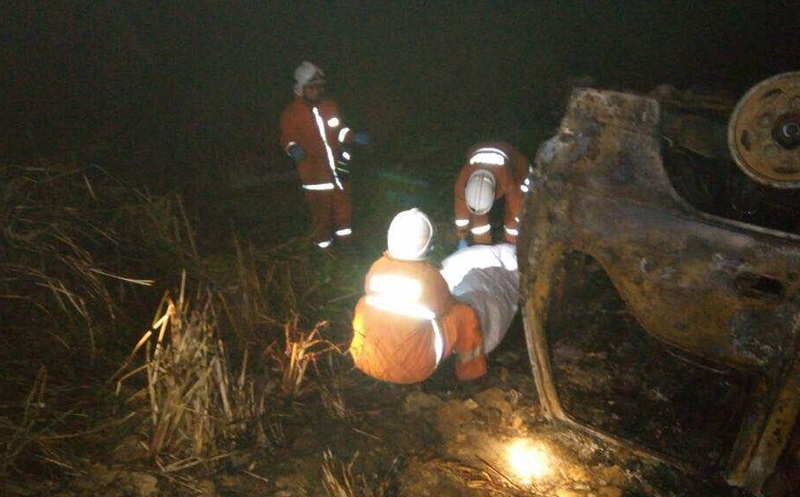 SANDAKAN: Two children, aged five and eight, were burnt to death Saturday night when a lorry carrying liquefied petroleum gas tanks, skidded and crashed into a ravine at Kampung Pampang, Batu 10 near here. Rescuers from the Sandakan Fire and Rescue Department (BOMBA) here only found the charred remains of the girls, identified as Marcilla Fairuz, 4, and her sister, Amanda, 8, after the fire was put out. Both were found trapped inside the six-tonne lorry in the 7pm incident. A female passenger said to be in her 20s suffered severe burns, with over 70 percent of her body burnt, while the 32-year old driver, Asim Taladu, was slightly injured. They are undergoing treatment at the Duchess of Kent Hospital here, where the remains of the two girls were also taken. It could not be immediately ascertained how the victims are related to the woman and the driver. According to a district BOMBA spokesman, they recieved a distress call at 7.13pm and deployed two fire engines with 10 personnel to the scene. “They managed to control the blaze some 40 minutes later,” said the spokesman.